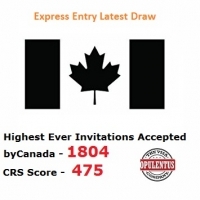 Once again 45th Canada express entry blew back favoring applicants. 22nd draw held on 19th October 2016 accepted 1,804 applicants to apply for permanent residency highest number ever since express entry started in 2015, who scored Comprehensive Ranking System (CRS) points 475 and above. This time, CRS score is quite low after 12 draws in 2016 bringing cheers in candidates. This year earlier Canada immigrations officials informed that they increased the number ITAs in the month of September and October of 2016, now the consequences are evidenced that they stood on their words. The track record of Canada Express Entry always maintains and creates the active wavelength for the for applicants. Canada is the finest economy and one of the advanced level countries in the world, required numerous skilled professionals in construction and engineering, so it encourages qualified immigrants into the country who can apply for Canada permanent residency. Skilled professionals with a valid job offer from Canadian employers have more chances of getting Permanent residence in Canada easily.